Buddhism allows for any marriage ceremony and celebration. Marriage is a custom that is practiced around the world by people of every race, religion and sexual orientation. While many religions view this rite as an inherently religious practice, Buddhism does not ascribe to this notion. In the Buddhist tradition, marriage, birth and death ceremonies are viewed as social practices that vary in their content and construction based on the culture in which they are being performed. Because of this, a variety of Buddhist rituals can be performed before, during and after a wedding ceremony as a blessing to the couple. 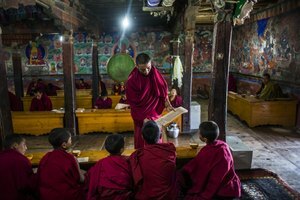 As the life of a Buddhist practitioner is dictated less from a religious aspect and more from a conscious moral aspect, Buddhist customs have tended to merge with the social traditions found within each culture, sometimes even including other religion's customs and practices. As such, Buddhism regards marriage as a secular act that is outside of the teachings of the Buddha; at no point did the Buddha give laws regarding marriage and wedding ceremonies. 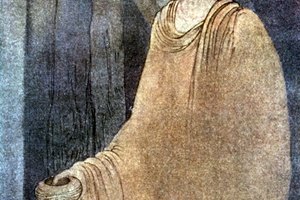 However, the Buddha did speak of the joys and pains of marriage. His teachings contain advice to married couples on how to maintain happiness and to allow the marriage to benefit all beings, a basic tenet of Buddhist practice. Offerings of incense, candles and flowers are made during the wedding ceremony. It is common for Buddhist couples, regardless of culture, to seek marriage blessings from a monk or nun at some point in the marriage process. In India, couples frequently seek a monk's advice for picking an auspicious wedding day as well as his or her presence at the wedding for performing blessings and leading chants. In India and throughout the rest of the world, the typical Buddhist portion of the ceremony consists of the recitation of prayers and chants, generally Vandana, Tisarana and Pancasila, and the presentation of offerings at the shrine. Offerings are made in the usual way for Buddhist worship including candles, incense and flowers. Marriage is a commitment to loving each other and all beings. In addition to the secular vows of the ceremony, couples can elect to make vows from a Buddhist perspective on their marriage. The most basic of these is the vow to always approach each other from a place of love and compassion, to be faithful and to fulfill all duties to make the other happy. In light of the increasing desire for full Buddhist vows, Lama Yeshe created a complete wedding ceremony from the Buddhist perspective, including vows to be taken by the couple. At the heart of each of these nine vows is the understanding that the marriage itself should support each person's commitment to each other, to their awakening and to the enlightenment and benefit of all living beings. Malas can be used as a symbol of union and devotion in marriage ceremonies. Malas have often been seen as symbols of both Buddhism and Hinduism. In Buddhist practice, malas are used during meditations, chanting and recitation of mantras and sutras. Typically these objects are used simply as counters as every mala contains the auspicious number of 108 beads. Malas can, however, be used in a variety of ways during a wedding. Of course the couple can elect to wear their malas throughout the ceremony, as the material from which they are made can be used to confer blessings, clear obstacles and increase energy. Additionally, malas can be used as a symbol of the couple's union by wrapping a single mala around the couple's head, most frequently performed in India, or around their hands (right hand of one spouse to left hand of the other), akin to the pagan practice of handfasting. Andras, Tiffany. "Buddhist Prayer Beads Used in a Wedding." Synonym, https://classroom.synonym.com/buddhist-prayer-beads-used-in-a-wedding-12086761.html. 29 September 2017. 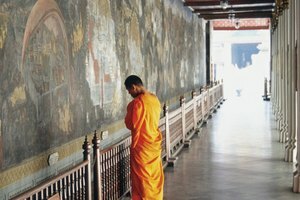 What Chores Do Buddhist Monks Do & What Ceremonies Do They Do?